Answer: Unless ducks are marked with a transmitter, we can only speculate where they are headed. 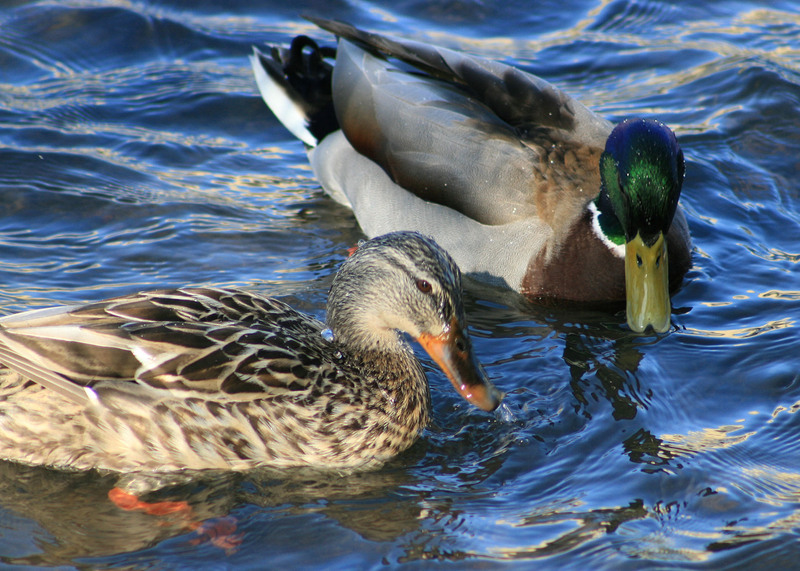 Most likely the ducks in your backyard are a drake and hen pair that need a safe place to build a nest. Backyard pools generally don’t have many predators so ducks often nest nearby them. Once the eggs hatch, they won’t want to hang out in the pool for long because there is no food in the water. At that point, you may want to open your backyard gate so the hen can walk her brood out to a nearby river or other water source. Since waterfowl are protected by the U.S. Fish and Wildlife Service, you cannot catch and move them yourself. It is a state and federal violation to disturb the nest of any bird, and you can’t take the eggs or move the nest. You might try contacting a permitted local wildlife rehabilitation center to ask for advice, but wildlife rehabbers cannot possess healthy wildlife or relocate the juvenile ducks or their mother. They can only take the ducklings if they are injured or orphaned, and technically they cannot do anything about the situation you’ve described unless the ducklings become injured or orphaned. If this happens again, try covering the pool and hazing the ducks away before they build their nest. Once the eggs are laid, a person is “technically” powerless to do anything to the nest or eggs. For a list of permitted wildlife rehab facilities, please go to www.dfg.ca.gov/wildlife/WIL/rehab/facilities.html. Are hooks with pinched barbs legal for fishing salmon? Answer: True. As long as it is pinched all the way down so there is no barb. It’s safer to just buy barbless hooks or grind off the barbs. Barbless hooks are defined as, “A fish hook from which the barb or barbs have been removed or completely bent closed, or which is manufactured without barbs” (California Code of Regulations Title 14, section 1.19). Answer: Yes, any wildlife officer can ask for your consent to inspect a vehicle. Whether an officer has the authority to conduct an inspection when consent is not given depends upon the specific circumstances of the contact. Wildlife officers have extensive inspection authorities that are unique to their jobs. For example, it is a crime to refuse to show a wildlife officer “… all licenses, tags, and the birds, mammals, fish, reptiles or amphibians taken or otherwise dealt with under this code, and any device or apparatus designed to be, and capable of being, used to take birds, mammals, fish, reptiles, or amphibians” (Fish and Game Code, section 2012). Also, wildlife officers are authorized to inspect all receptacles, except the clothing actually worn by a person at the time of inspection, where birds, mammals, fish, reptiles, or amphibians may be stored or placed (FGC, section 1006). Fishing multiple rods from shore outside San Francisco Bay? Answer: No, that’s not correct. Outside of the Golden Gate, if you are fishing from shore for halibut and striped bass, you can use as many rods and hooks as you want. If you were to catch another species like salmon or rockfish, however, you would have to release it, as only one line may be used for these species. This entry was posted in Freshwater Fishing, Lines/Rods/Equipment, Methods Of Take, Nuisance Animals & Pests, Saltwater Fishing, Tackle, Uncategorized, Wildlife Encounters and tagged fishing tackle, freshwater fishing, nuisance wildlife, ocean fishing, regulations, salmon fishing, waterfowl. Bookmark the permalink.